Our President can not rule our Nation effectively now that our Congress is totally polarized. The leaders of the Democrats refuse to compromise with the leaders of our Republicans. Mr. Trump walked out of a meeting yesterday due to this polarization. America’s problems will worsen as voter confidence wanes in the coming days, weeks, and months. 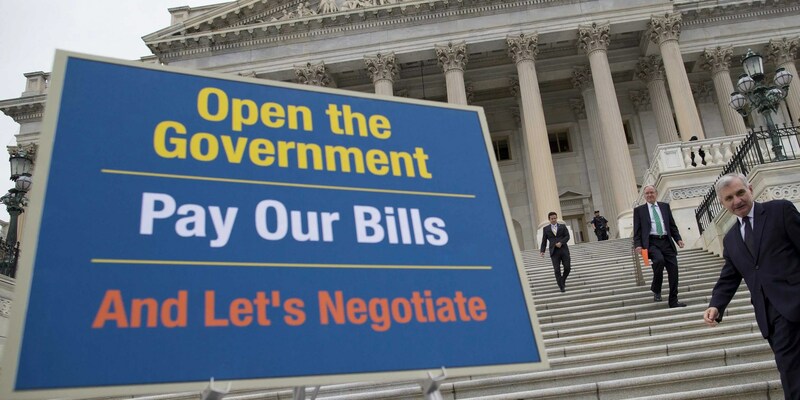 Some 800,000 government workers are being affected by the current shutdown and one side must compromise if this situation is to get resolved. Our problems are mostly over money and control of public opinion. America has no solution to our debt issues and this means that money problems will grow exponentially. The ‘Wall’ issue is merely a symptom of much deeper problems. Look at this website for evidence of our serious money problems: http://www.usdebtclock.org. America’s liabilities per taxpayer are nearly $1 million. Who can resolve this dire situation? Our national debt is $22 trillion and none of our leaders have a solution for this continuing problem. Deficits will be nearly $1 trillion this year and continuing into infinity (as nothing gets done). Trump’s focus on our trade deficit has not changed the trend. Our trade deficit is now worse than prior to his election. Americans seem oblivious to all these issues and there seems to be NO leader which can bring back confidence to our markets. So what is happening to keep things from crashing? We now live with a computer trading market where select computers can manipulate all our markets. Have you noticed how these electronic markets are manipulated daily? Key traders within our Central Bank system can trade these markets and pump-up the numbers even as our real economy declines. I have watched what is happening over in Venezuela with their electronic markets…as a model of what our elites can do here. Electronic markets can be manipulated daily by select traders who have trading $$$ to manipulate with. Did you realize that our New York Fed has some 500 day traders manipulating our markets daily. Why this situation? Who is monitoring this cartel of traders operating behind closed doors? Who gives these traders directions for their trading activity? Why no media attention to this situation? Computers and select traders can now manipulate all these electronic markets via robots and algorithms. Today’s Wall Street Journal has an article on algorithms. These algorithms chase ‘price trends’ to change these markets. It’s all done with robots and algorithms. An algorithm can be programmed to trade per instructions without any human input. It’s all done automatically today. What happened to the Open Out-cry System (which operated prior to the 2008 financial crisis)? Our economy could lose total confidence and yet select computers (via algorithms) could continue to pump-up these electronic markets. The Caracas General exchange over in Venezuela is up some 98% in 5 days and 328% in one month even as this economy suffers an economic depression. Is this logical? Who can pump-up a market like this as the general economy tanks? It’s computers operating behind closed doors! It’s all done today with computers, robots, artificial intelligence, and programmed algorithms. A few traders (such as those within our Central Banks) can rig and manipulate any market. These traders can receive unlimited trading funds from their banksters who create our digital money out-of-nothing. Money with NO tie to material reality is our real problem today. Our digital money system has NO tie to material reality (like gold or silver). Money units are created out-of-nothing via the computer and units flow from computer to computer. Is this a logical and sound system for global commerce? I don’t think so! This entire system is corrupt, rigged, and subject to a crash (eventually). It will likely happen sometime in 2019. Those with some wisdom will get out of digital stocks and bonds and get into tangible investments. Digital money is not tangible. Digital money consists of photon images (mere numbers) flowing within this space called cyberspace. There is no tie of these units to anything tangible. Get out of these units (at least partially). Our system is the problem. The coming Davos meeting called the World Economic Forum (WEF), January 23 – 25 will likely give us some idea where events will go in 2019. Mr. Trump and his cadre of politicians may attend this event in a couple of weeks. This group of world leaders who attend this event will decide the direction for our economy in 2019 IMO. Will rigging and manipulation continue or will our markets crash with a RESET after? https://www.cnbc.com/davos-world-economic-forum/. Soldiers, snipers, and security will protect this venue of leaders who make up our Deep State operators. The WEF will propose a digital economy for the planet. Is this what the people desire? Who will vote for this new system? Get yourself educated on all these issues as everyone will be impacted by what happens over in Davos this January. Enjoy! I am: https://kingdomecon.wordpress.com. ← The Throne of our Creator God (visualized)! Money is an usurious item.Jews,Christians and Moslem acknowledge this part.We allowed private party to create and multiply this usurious item through debt under usurious basis.Now we are facing the irreversible consequences.The worse is yet to come.Like you said,we have to go back to real money and people through their government should take back the function of issuing money.